As described in an archival document, A.G. Becker & Co., Incorporated, came into existence on July 2, 1894, with a capitalization of 750 shares at a par value of $100 per share, or a total capital of $75,000. The initial shareholders of the new corporation were: Rachel M. Schaffner, 450 shares ($45,000); Kittie F. Becker, 230 shares ($23,000); Monroe J. Friedman, 30 shares ($3,000); and Oscar J. Friedman, 40 shares ($4,000). Rachel Schaffner was of course A.G. Becker's sister (and widow of Herman Schaffner); Kittie Becker was A.G.'s wife; and Monroe and Oscar Friedman were brothers of Kittie Becker and therefore brothers-in-law of A.G. It is noteworthy that, although the ownership of the new corporation was kept "in the family," and perhaps A.G. loaned funds to his wife for her purchase, he in fact had no direct stock ownership in the new corporation. This arrangement might well have been suitable in mid-1894, since even at that time A.G. may have been under some cloud of possible financial liability for the Schaffner bank failure, or in violation of Illinois banking law. It is also noteworthy that the Friedman brothers were issued shares with a total value of $7,000, possibly in connection with their having been a source of funding in such amount during the first year of the Becker proprietorship. Immediately upon incorporation, the organizing document shows that A.G. Becker & Co., Incorporated, purchased "the business of Rachel M. Schaffner" for $45,000. This is very interesting! A.G. Becker must have considered that, from mid-1893 until mid-1894, he was carrying on the business owned by Herman Schaffner's widow. However, this concept and language might well have been adopted for some legal reasons, in light of the unsettled liabilities of A.G. Becker and the Herman Schaffner Estate. It is also noteworthy that the "Rachel Schaffner business" was purchased for $45,000 from Rachel Schaffner, who in turn personally provided $45,000 in capital to the new corporation. Her sole "ownership" of the A.G. Becker proprietorship was essentially exchanged for a 60 percent interest in the succeeding A.G. Becker corporation. The archival document then goes on to list the assets of the business being purchased at $75,996, consisting of $49,904 of bills receivable ("commercial paper"), $12,355 in stocks and bonds, and the balance in miscellaneous assets. Liabilities being assumed were $39,543, including $35,000 borrowed from the Atlas National Bank, and the balance in miscellaneous payables. Thus, the new corporation paid Rachel Schaffner exactly $45,000, which is somewhat more than the net asset value of the business being acquired, but equal to the par value of the stock issued to her. It is of course conjecture, but perhaps Rachel Schaffner provided A.G. Becker, from some source, say, $50,000 with which to carry forward the commercial paper business of Herman Schaffner & Co., and that prior to incorporation, Mr. Becker was able to repay $5,000 of such advance, turning the balance into a 60 percent interest in the new corporation. Another enigma in the A.G. Becker story. As mentioned earlier, A.G. Becker was resolved to focus all his energies on the commercial paper business, the area of the Schaffner bank business in which he spent most if not all of his time. It was noted in the newspapers that, at the time of Herman Schaffner's disappearance, the Schaffner Bank had recently enjoyed (presumably in 1892) an annual turnover of about $35 million in paper placed. It is interesting to speculate that if A.G. Becker were able in 1894 and forward years to regain, say, 50 percent of that turnover and realize a discount commission of, say, 1/2 percent per annum (which rate was apparently prevalent at that time), the ongoing firm could have realized gross income of approximately $800,000-900,000 per annum. Even after expenses and handsome compensation to A.G. Becker as manager, this could have been quite profitable for shareholders. In the Becker archives, there was a "statement of the business" dated December 31, 1897, and signed by A.G. Becker. This may have been a statement which A.G. shared with banks, as well as the family shareholders, to communicate how the business had progressed since incorporation, and where the business stood at the end of 1897. As can be seen, the company's retained earnings ("cumulative profit and loss") since inception amounted to $78,452, to which should be added $44,250 in dividends paid out over the applicable period, resulting in an estimated total profit for the period of $122,692. This would mean that profits for the 3 ½ year-period were somewhat over 1.6 times original capital, or equal to a compounded return on equity per annum of just above 30 per cent. Even though the economic environment during the late 1890s was favorable for the new business, this was still an exceptional return. 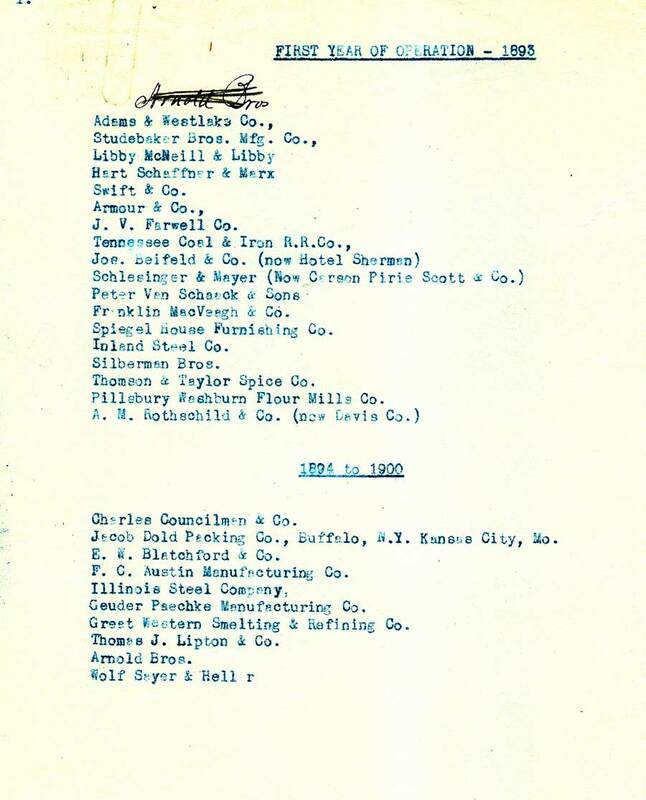 Finally, as to some hint of the nature of the business being carried on by A.G. Becker from incorporation through the end of 1899, a list in the archives shows 18 companies – some quite prominent - which were issuers of commercial paper in 1893, the firm's “first year of operation.” Below, in that list, were additional issuers apparently taken on in 1894-1900. Another list shows some 50 names presumably already on the books, before the 1900s, with a small list in the upper right hand corner showing 13 names of "Custermers" apparently added or retained in 1900-1902 (including a number of Westinghouse names – see later). And a final table (not shown due to illegibility) in the archives lists over 150 "bank customers in the early days who are still in business and customers of ours at the present time." Presumably, the total number of banks who were commercial paper customers of A.G. Becker & Co. by the early 1900s well exceeded this early base number. It is not clear when these various lists were prepared, but it seems to be very close to the turn of the century. Clearly by this juncture, the business of A.G. Becker & Co., Incorporated, was strongly rooted.